Bio Notes: Aston Webb was born at Clapham on 22 May 1849 the son of Edward Webb an engraver and watercolour artist. He was articled to Banks & Barry from 1886 to 1871, during which period he took classes at the Architectural Association. He made an extensive continental study tour in 1871-1872 and won the Pugin Studentship in 1873. He commenced independent practice in that year but the next two years were principally spent in assisting other architects. He was admitted ARIBA on 9 February 1874, his proposers being Charles Barry Junior, Augustus Frere and Henry Currey. After some years Webb took into partnership Edward Ingress Bell. In 1885 the partnership of Webb & Bell made its name by winning the competition for the Birmingham Law Courts and in 1891 that for the South Kensington Museum; that for Christ's Hospital in Horsham followed in 1894. These successes brought in their wake a long series of public commissions and further competition successes notably that for the improvement of the Mall in 1901. 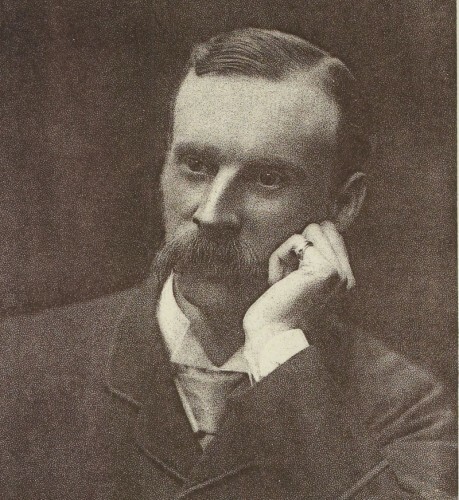 Webb was President of the RIBA in 1902-04 and was knighted in the latter year. He received the Royal Gold Medal in 1905 and the American Gold Medal in 1907. He was President of the Royal Academy 1919-24. By the tiem of the death of Bell in 1914, Webb had taken his son Maurice Everett Webb, born 23 April 1880, into partnership. Webb died on 21 August 1930.